I found the above sign yesterday on Greenpoint Avenue in Sunnyside, Queens. Whoever made this clearly lavished a lot of attention upon the illustration at the top right-hand corner. The raffish little rabbit peeking out from behind the tree is a nice touch. If this sign is any indication, Sunnyside lives up to its name. 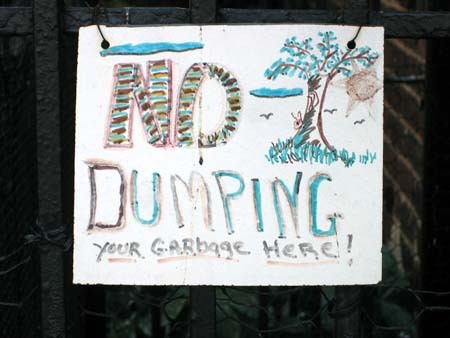 Now, for the sake of comparison let’s look at a sign I found right here in “The Garden Spot” the day before. 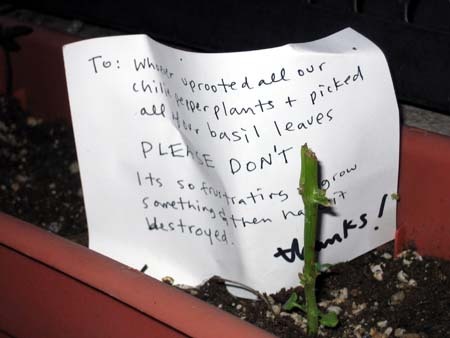 Its so frustrating to grow something & then have it destroyed. It would appear that someone on Green Street has a taste for basil.